It is that time of the month again. Microsoft released a group of system updates and security patches to address vulnerabilities found in their systems. As not all updates are applicable or safe for all systems, ProLogic IT will review each update and evaluate if it is safe to apply to your systems. This means our engineers will be working beyond regular maintenance hours to perform the task. 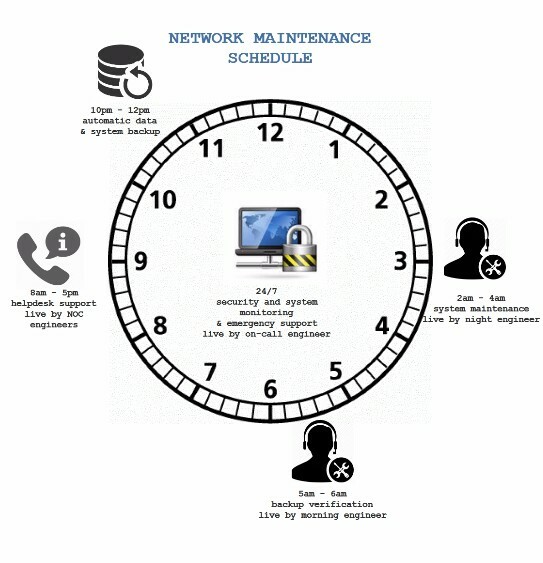 For reference the below illustration depicts our standard daily maintenance schedule, if you need to access your network remotely after hours, please kindly check with us to make sure there is no conflict of schedule. Thank you for your support allowing us to keep your network safe and secure!